We love our little piece of solitude! This is our open concept cottage with a full kitchen, 3/4 bath, queen bed and a twin size pull out sofa! The back deck is very private with comfortable seating, perfect place to relax with a cool drink after a day at the beach! Captain's Catch is fully equipped with everything you'll need for a relaxed and comfortable stay! Owners live ten miles away, so if you should have any questions or concerns we' ll be there in a jiffy! The Pemaquid peninsula is the most beautiful and peaceful on the coast of Maine! Conveniently located in the mid-coast area. Our cottage is a five minute walk to the beautiful white sand Pemaquid beach and a five minute drive to the famous Pemaquid Light House! Several privately owned eateries, (no chain restaurants here), await your palate! If you need to do more exploring, the quaint village of Newcastle/Damariscotta is just 20 minutes up the peninsula! Camden Harbor is an hour drive up the coast and if its outlet shopping you fancy, Freeport, (home of LLBean), is just an hour down the coast! We are a retired couple who love living in Maine! We're very active, outdoor adventurers! Some of our children and grandchildren also live in the area and we all spend a lot of our summer days relaxing or exploring the beautiful coast! Our grandchildren have a blast here and we're all making wonderful memories! We want to welcome you to enjoy what we're so grateful to experience every day! Our little cottage is perfect for a couple, couple with one or two children or the lucky single traveler looking for some quiet solitude! Captain's Catch is priced so right! For those who are looking for a comfortable, quiet and very clean accommodation without spending a fortune, this is the place for you! I think one of the most attractive aspects of this cottage is that it's a five minute walk to what I believe is the prettiest beach in the world and I've been to several beaches all around the world! There are so many hiking trails located all over the peninsula that are spectacular! Our cottage is 1/2 mile to public white sand beach. Its a five minute walk. The quaint village of New Harbor is .08 of a mile up the road! Large lawn with swing in big red maple tree. Our cozy cottage is so comfortable and private! Enjoy walking to the beach or riding your bike around the peninsula! It's just a great little place for a great price! Great cottage. Kathleen had flowers, fans and windows open when we arrived! Very charming cottage in a charming seaside village. Plenty of things to do and see and a wide variety of local dining. We used the cottage as a home base for 3 weeks of driving up and down the coast visiting lots of towns. Kathleen was very receptive to any requests we made. Kitchen was well equipped, great shower and comfy bed. We appreciated the full size fridge, stove and grill. It was a pleasure having you all at Captain's Catch! I only hope that you'll come back and stay again! Take care and have a wonderful winter! Captain’s Catch was a very comfortable cottage and located in a quiet but not deserted area. It is close to Pemaquid Point Lighthouse, and Pemaquid Beach. The cottage had everything I needed. The week was unusually hot and humid and I was glad to have the fans. Unfortunately, windows on one side of the cottage didn’t,t open - except for one that opened just a few inches. That was the only “hiccup “ and wouldn’t have been an issue if the weather was cooler. New Harbor and neighboring villages made for interesting adventures and great meals. I wanted to experience a different part of Maine and Captain’s Catch was a great home base for trips to Rockland, Port Clyde, Boothbay and Damariscotta. Visited lighthouses, forts and enjoyed an informative boat trip down the Damariscotta River learning about oyster farming and the river. Would definitely recommend Captain’s Catch for a relaxing stay in the area. Kathleen is easy to work with and was open to the few suggestions of added amenities that were presented to her. I would stay there again. A ceiling fan with a light in the kitchen would brighten that space up and more shelves OR a chest of drawers would be a welcome addition. I had a wonderful time in New Harbor, as I always do. I'm so glad that you enjoyed your time at Captain's Catch! It is a lovely place and a great location! I appreciate your suggestions and I am going to install a ceiling fan for next season and a dresser! Have a great year and I hope to see you again! Location is amazing. Slice of heaven!! The area is very quaint and the little town is amazing. The cottage is located very central to everything and is well maintained. We noticed how clean it was and the grill was almost new. The cottage is small, but has a well stocked kitchen so it is great to cook and prep meals. As small as the house is, the property is big, green and open. There is green grass surrounding the house with plenty of parking and play-space and we loved the swing hanging from one of the large trees in the yard. The only white sandy beach in Maine is right down the street and the town has two harbors and a amazing lighthouse set on the raggedy coast. The only suggestion I would have is to add a small dish washer. I always feel that dishes seem cleaner when washed that way and I seem to question germs on hand washed dishes, specially when coming into a space where everything was used by strangers before. But this might be just me. 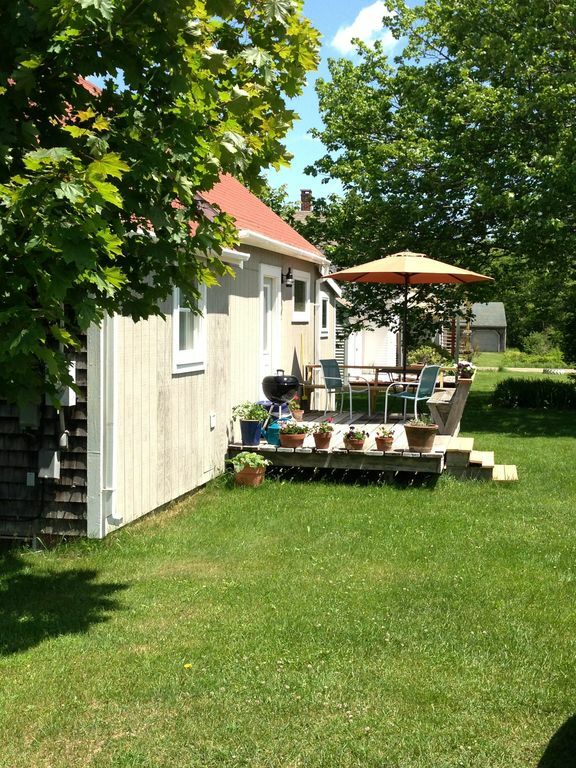 If you are looking for a affordable, centrally located but quiet cottage, look no further. Ideal for a couple. Thanks for providing a unforgettable home! Whether you're looking to relax on the beautiful white sand beach located just 1/2 mile down the road or you'd like to go hiking one of the many well maintained hiking trails, the Pemaquid Peninsula is the perfect get away. If you want to venture off the peninsula, there's the bustling twin villages of Damariscotta and Newcastle which provide fine dining, shopping or a movie at the local theater! L.L. Bean is just one hour south and the beautiful town of Camden just an hour up the coast! New Englands finest Botanical Garden is just a 45 minute drive in the town of Boothbay, a must see!